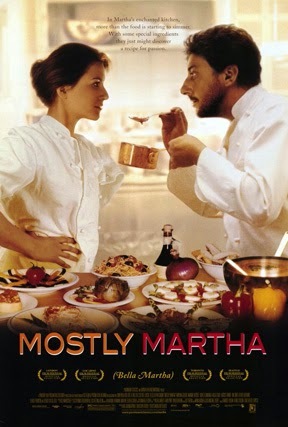 Mostly Martha is the story of Martha Klein, a successful but headstrong chef who has to take in her eight-year-old niece, Lina, after the unexpected death of Martha’s sister. There’s little room in Martha’s busy lifestyle—and her one-bedroom apartment—for a grieving girl, and she struggles with becoming a parental figure. Enter Mario, who’s hired to keep the kitchen running smoothly. But he’s always late and plays Italian opera while cooking, and Martha’s convinced he wants her job. Of course, Mario’s a good guy who only wants to work with Martha because he admires her, and this is hammered home when he helps get Lina to start eating again after Martha starts bringing her to work. It’s a lovely little story that manages to lock in on the sadness of the situation as well as the way adversity can actually change someone’s life for the better. As wonderful as the story as a whole was, Martina Gedeck as Martha was easily the best thing about the movie. I was in a terrible class in college where we had to watch Death in Venice, a movie from the ‘70s based on the Thomas Mann novella. It’s a little over two hours long, but I think it contains around forty minutes of dialogue. The rest is filled with music. I actually hated it (I might enjoy it outside of that class, though. Who knows? ), but I bring it up because I think a lot of what made Mostly Martha shine was the silences. The dialogue never really rises above average (but that could totally be a translation thing. German is so hard! ), but although Mostly Martha relies less on music than Death in Venice, the moments of silence are key to buying into Martha’s growth. From her reactions, it’s easy to see the subtle changes as she goes from self-sufficient career woman to a woman open enough to let a child into her heart. It was remade in 2007 as No Reservations, starring Catherine Zeta-Jones and Aaron Eckhart. I haven’t seen the American version in at least three years, but a lot of scenes were very reminiscent of Mostly Martha. Now that I’ve seen the original, I’m curious to rewatch it.